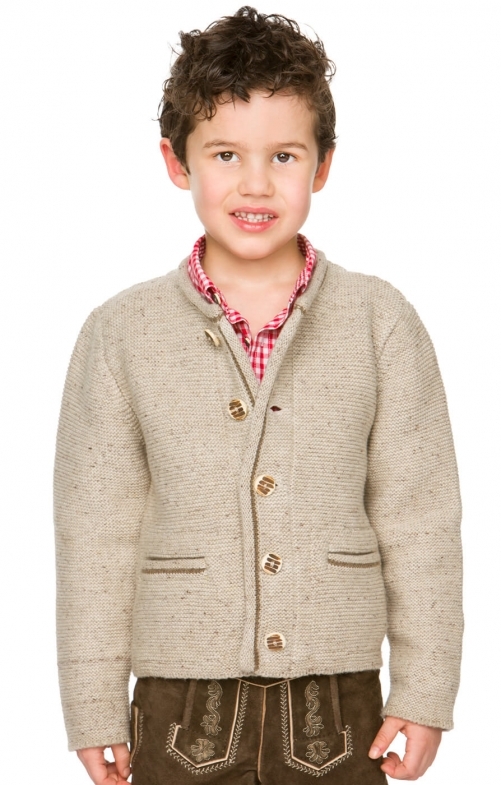 Children's Trachten Jersey Malo in Light Brown. This light brown boy’s jersey will keep the little one warm and is at the same time stylish, sure to be one of the favourite garments in the wardrobe of any fashion-loving boy. The jersey is made from a blend of 50% wool and 50% polyester to make it very versatile and comfortable and boasts fawn piping around the edges of the front and the pocket that can be found on the left-hand side. The jersey can be fastened up the front with a row of five large buttons or left open to reveal a traditional dress shirt or modern T-shirt that can be worn underneath.